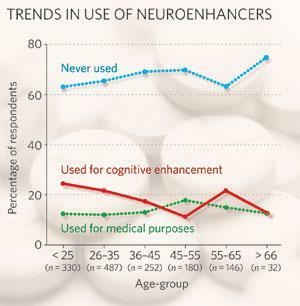 According to Nature, 20% of scientists in an informal survey admitted to using ‘cognitive enhancing’ drugs: Poll results: look who’s doping. Ironically, the original survey was triggered by an April Fool’s prank played on the scientific community. My initial thought was, Do they count caffeine? Of course, they didn’t. If they did, numbers would obviously be different. We asked specifically about three drugs: methylphenidate (Ritalin), a stimulant normally used to treat attention-deficit hyperactivity disorder but well-known on college campuses as a ‘study aid’; modafinil (Provigil), prescribed to treat sleep disorders but also used off-label to combat general fatigue or overcome jet lag; and beta blockers, drugs prescribed for cardiac arrhythmia that also have an anti-anxiety effect. The initial discussion that led to the poll was referenced by Daniel a while back in a great piece, Brain Enhancement: Beyond Either/Or, that explored this topic in greater detail. If you haven’t checked it out, you should. Daniel talks about the ‘unintended consequences’ that almost always accompany drug use. I don’t have too much to add to that except that, with what we know about neuroplasticity, this should not surprise us at all. The brain and nervous system tend to adapt to any changes in the overall environment they inhabit: the tasks they do, the condition of the environment (which is both inside and outside of the body), any other chemicals introduced into the equation. This entry was posted in Addiction, general, Medical anthropology, Stress. Bookmark the permalink. Хороший сайт pornodosa.ru – порно онлайн, онлайн порно, gjhyj и многое другое.